John Barboni, co-founder, is interviewed by Christine Haskell for the Seattle Examiner and Startup Nation on sustainability and elemental. 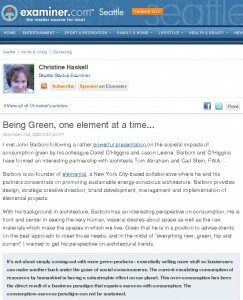 Being Green, one element at a time… 03Nov08 I met John Barboni following a rather powerful presentation on the societal impacts of consumption given by his colleague David O’Higgins and Jason Levine. Barboni and O’Higgins have formed an interesting partnership with architects Tom Abraham and Carl Stein, FAIA. Barboni is co-founder of elemental, a New York City-based collaborative where he and his partners concentrate on promoting sustainable energy-conscious architecture. Barboni provides design, strategic creative direction, brand development, management and implementation of elemental projects. With his background in architecture, Barboni has an interesting perspective on consumption. He is front and center in seeing the very human, visceral desires about space as well as the raw materials which make the spaces in which we live. Given that he is in a position to advise clients on the best approach to meet those needs, and in the midst of “everything new, green, hip and current” I wanted to get his perspective on architectural trends. "It’s not about simply coming-out with more green products – essentially selling more stuff so businesses can make another buck under the guise of social consciousness. The current escalating consumption of resources by humankind is having a catastrophic effect on our planet. This over-consumption has been the direct result of a business paradigm that equates success with consumption. The consumption=success paradigm can not be sustained. Businesses will enjoy steadier, more manageable growth if they are able to evolve an operating strategy in which the definition of success is decoupled from consumption. That’s where the optimism comes in. There is nowhere to go but up. Now is the time to lead – be a pioneer in your industry.